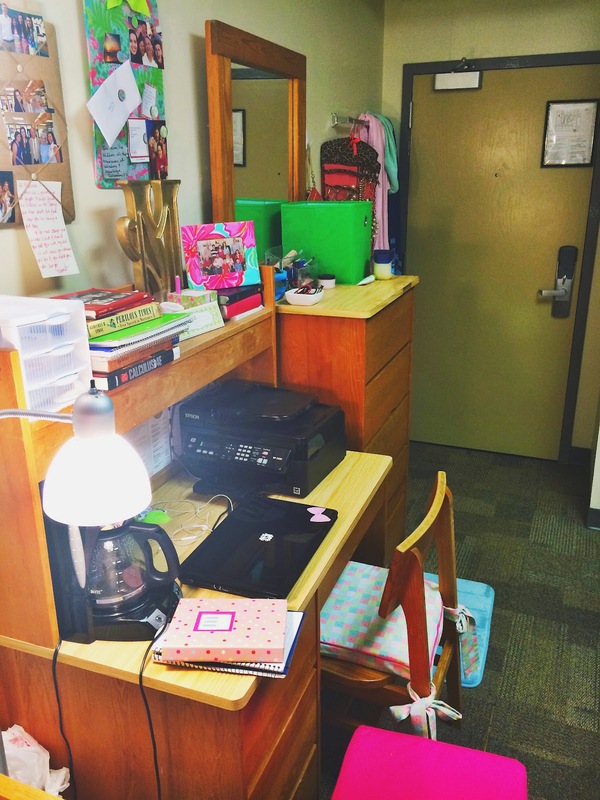 It's more dorm room stuff!! I guess I just took a long time because I wanted it to be clean and organized and all presentable for 'the blog'. But then again, I get frustrated when I see photos of a spotless home, like I know that it probably doesn't stay like that. So I tried to make my room as clean but as real as possible. 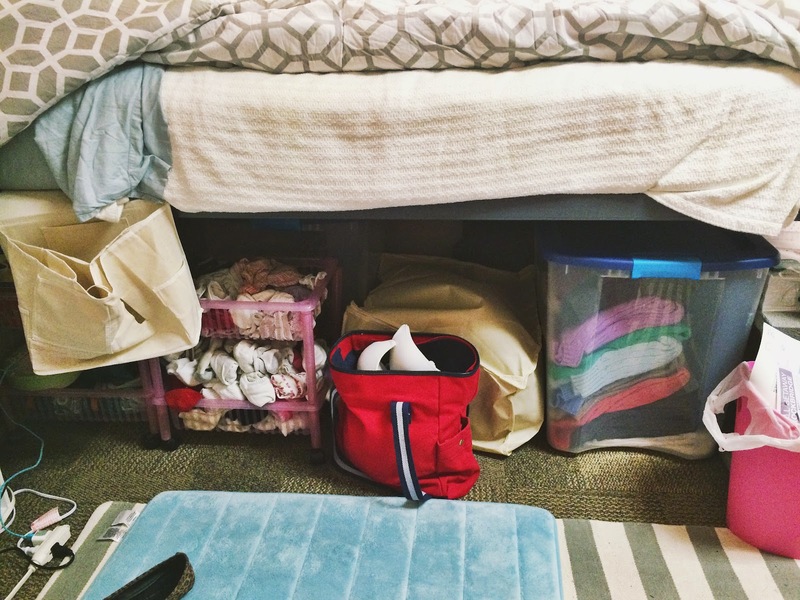 I'm really nosy and love looking through people's rooms and especially loved it when I was trying to figure out how I was going to organize my dorm, so I've included lots of photos, random or not. Also, I basically just walked through my room and snapped a photo of each thing. This is the view of my side when you walk in. 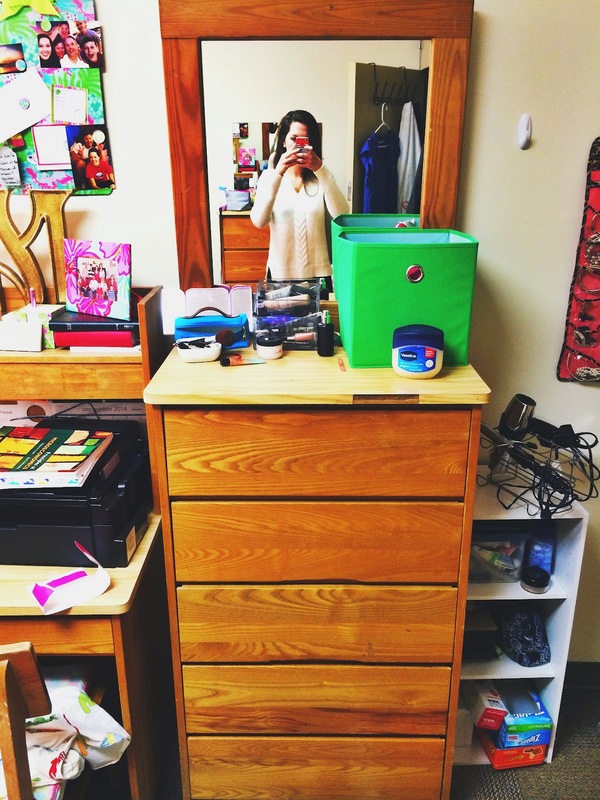 My dresser, then desk, then bed. This hold some of my jewelry (just not the statement necklaces) and I love having it here because I can see all of my options. 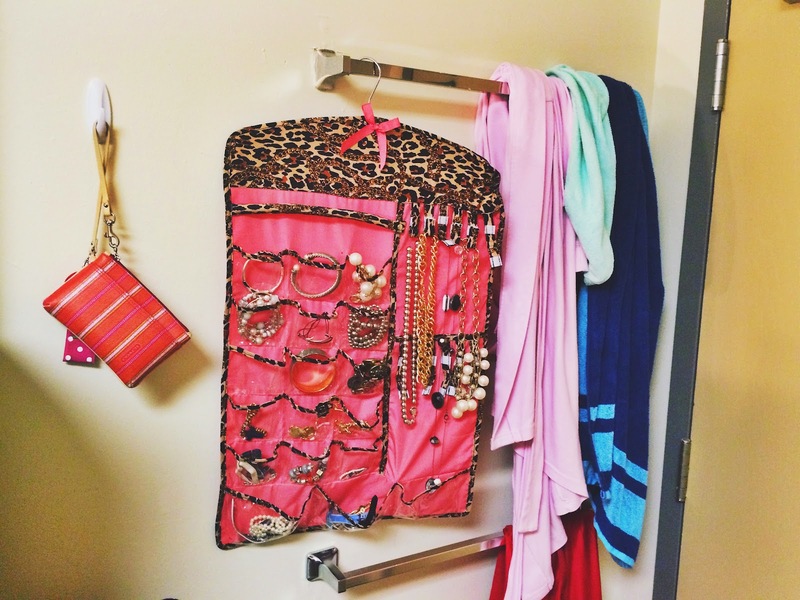 Then a bathrobe and towel hang next to it. My wristlet that I carry with me everywhere is to the left! 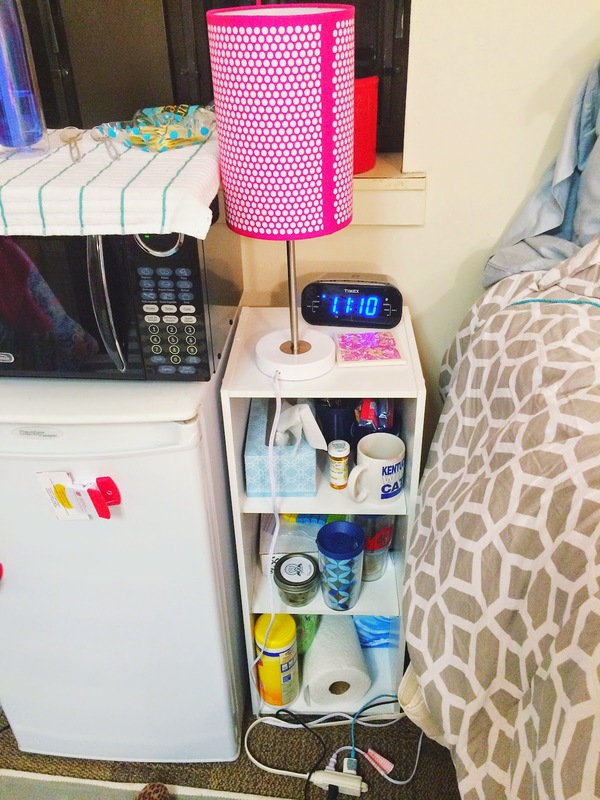 This little stand is right next to my dresser and door, and had originally been the mtaching nightstand for the roommate, but my new roommate actually had the same one, so now there are three of these white Target shelves in our room! It actually works out perfectly right here and has some of my random cosmetic items. You can see the hair appliance holder on top, which didn't stay on my wall and now sits there. Then there's jewelry in that tub and medicine on the first shelf, q-tips, cotton balls, and nail polish on the second, and ziplog bags and other random things on the very bottom. My dresser! 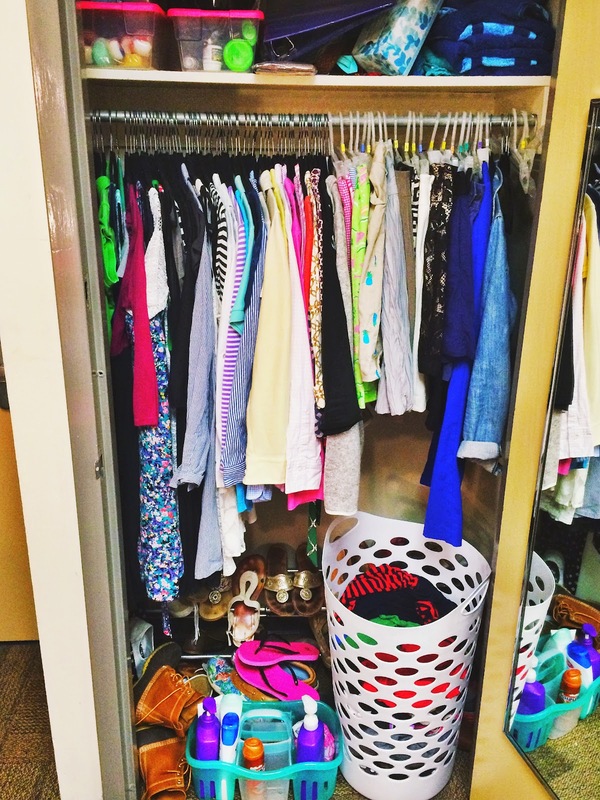 I organized my clothes so that it goes: basic tees and camis (I have a LOT of these and didn't have enough hangers to hang them), t-shirts, pants (including jeans, yoga pants, and leggings), shorts (which hopefully I can clear out once it gets cooler), and pajamas. All of my undergarments are under my bed, which isn't the best, but I had too many to fit into one drawer, which is valuable space. On top of my dresser I have my makeup, simple jewelry, and cosmetics. In that little blue Longchamp pouch, I keep my earrings, rings, and simple everyday necklaces (ie, my monogrammed one). I hadn't planned on keeping them in there at first, but now I'm SO glad that I did. I purchased the makeup organizer from Home Goods and it's the perfect size for all of my makeup. The white dish holds a few of my hair things (and my blush brush in this photo). 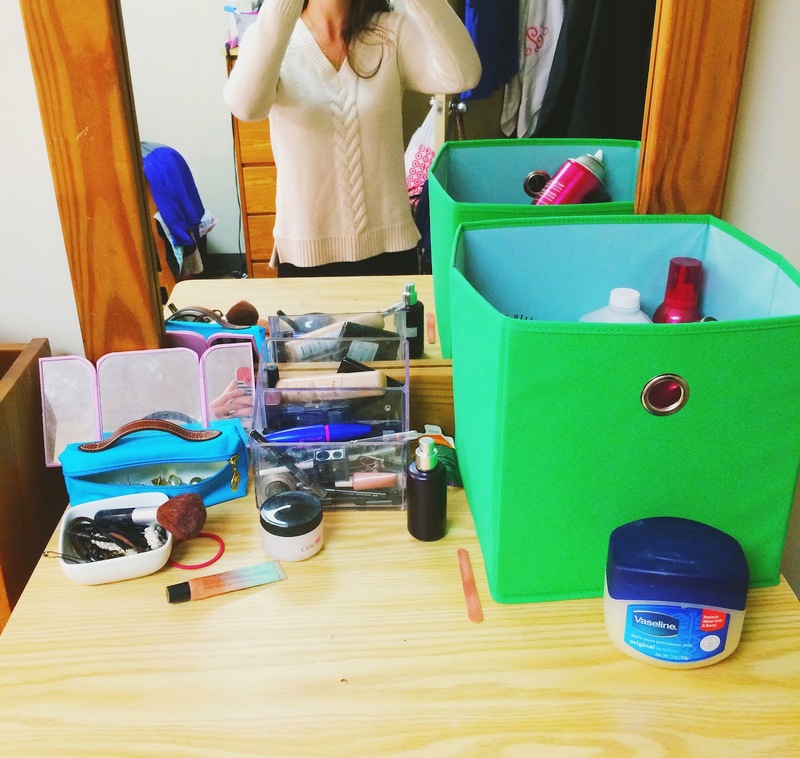 The green fabric drawer is the biggie- it holds everything else, from lotion to hair product to hairspray. I kind of just throw it all in there, which is nice so that it's not visible when you walk in. 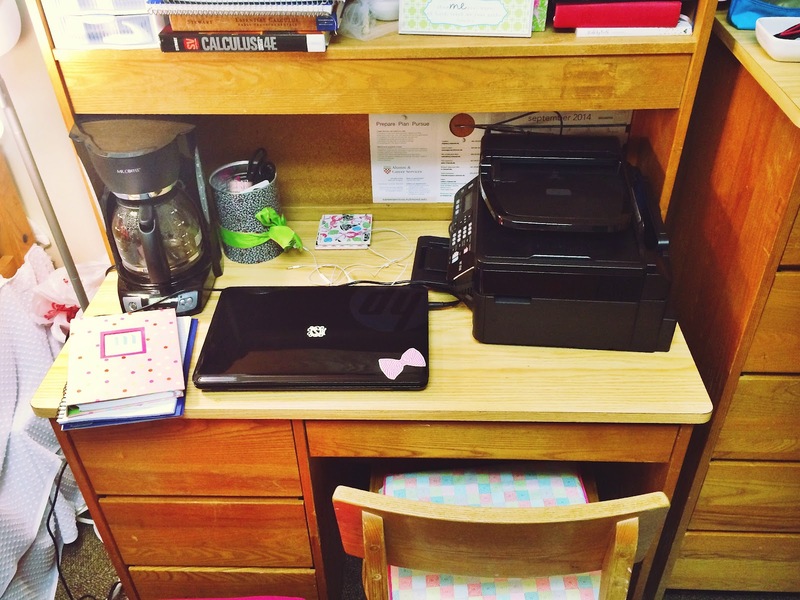 And my desk! Part of the reason I had avoided posting photos was because I knew I was going to move my printer. This is obviously pretty cramped, but I don't really work at my desk other than be on my computer, I'd rather go to the library. My printer can't print wirelessly, and because the only outlet is to the left of my desk, I had to keep it up here. That's also the reason you can see my beloved coffee pot on my desk... outlets have me going crazy. 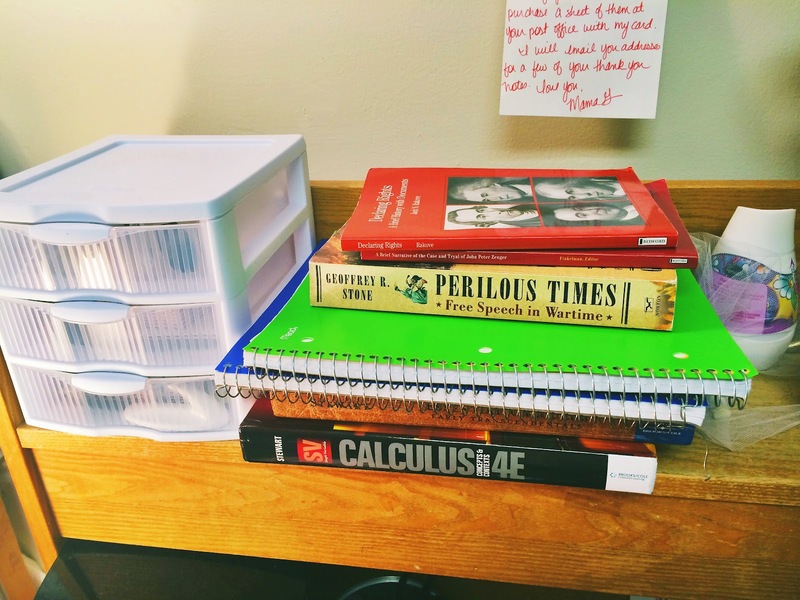 On top of my desk, I have three small drawers, then keep my books and notebooks above. 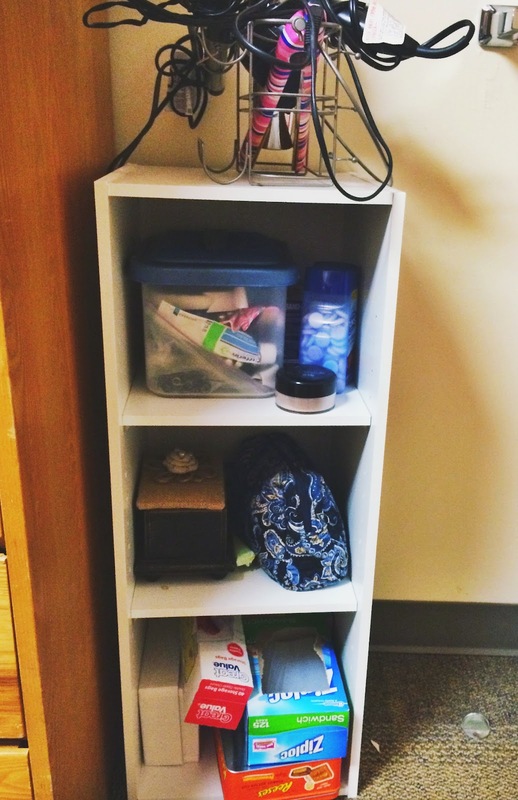 In the drawers, I store command strips, cards, and dry erase markers. This part of my desk makes me really happy in general. 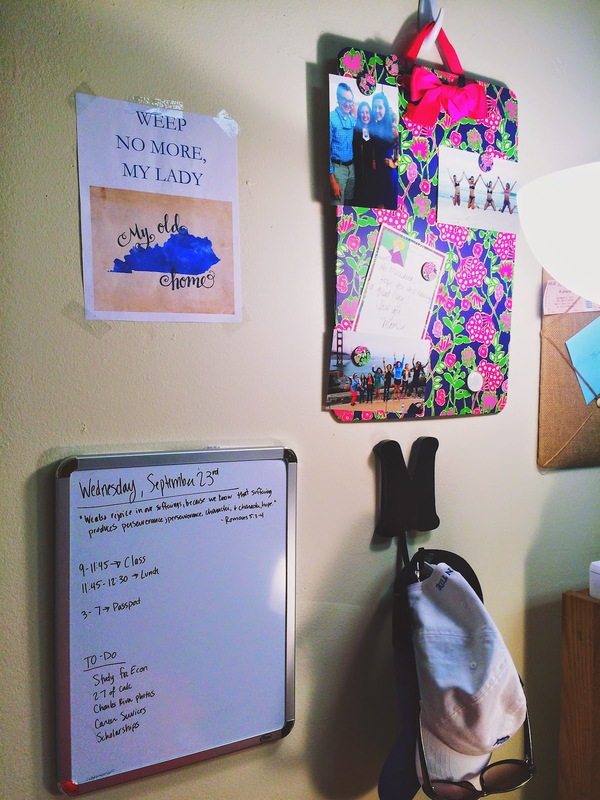 I have a Bible verse, my Bibles, notepad, large letter, and family photo. I have a few things above my desk, and this is on the right side. 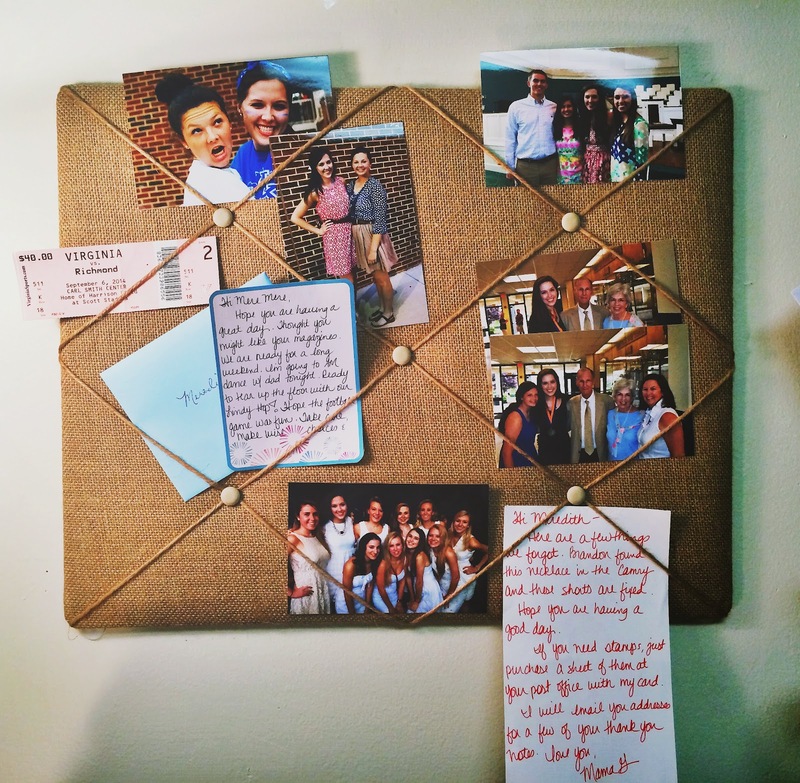 It's a magnetic Lilly board I got a few years ago where I've kept small notes and photos. 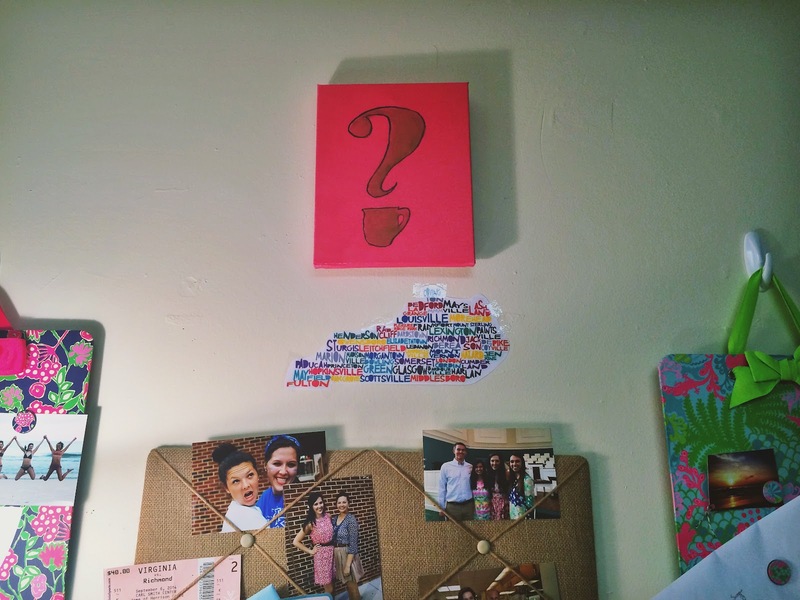 This is the memo board above my bed, given to me by a sweet friend the night before I left! I love being able to stick photos and mementos under the burlap. I painted this pink canvas a little bit ago at home and never hung it up, so I figured I'd bring it up for a little pink! This may be one of my favorite little parts of my room. 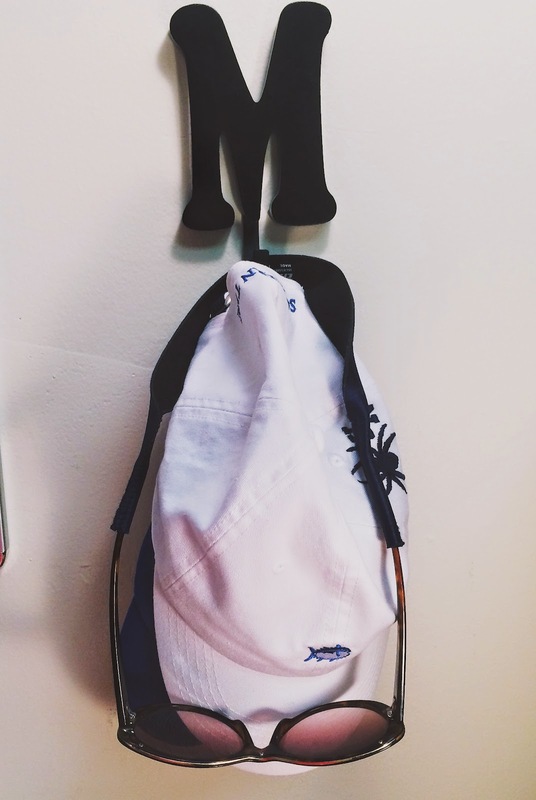 I was gifted this M hook a few years ago and didn't have much use for it in my room at home, but in college, everything's hanging, so it's a perfect fit for my hats and sunglasses. 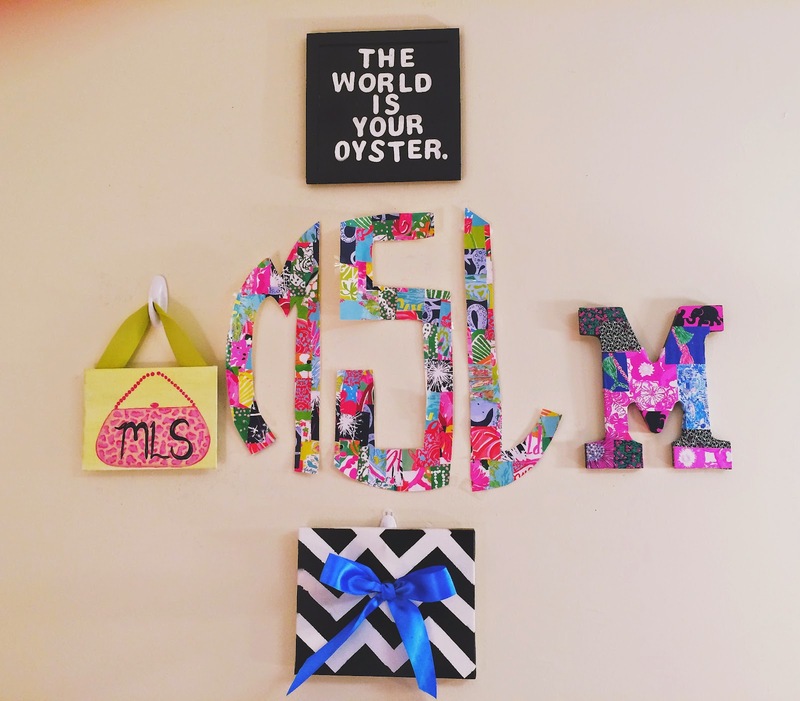 Ahh, the plethora of monograms. All of these were taken straight off my wall from home and I tried to organize them like I liked them here, right to the left above my bed. 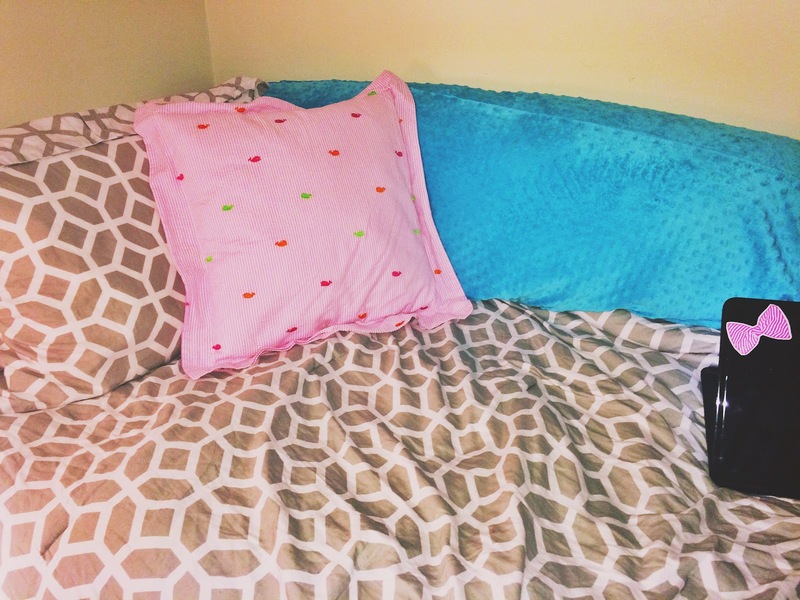 My bed itself makes me so happy! 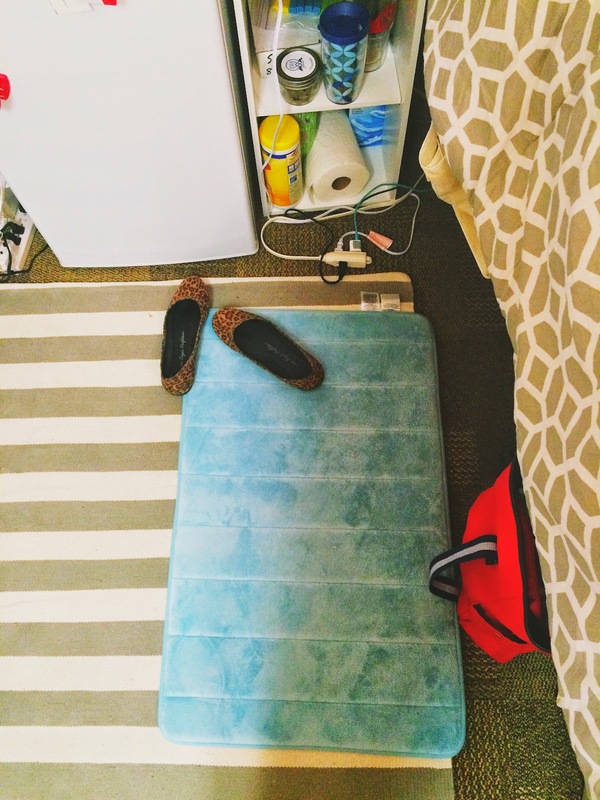 I was worried that it wouldn't feel like my bed at home and that it would be horribly uncomfortable, but with the right mattress pad and comforter, it's perfect. I have a normal twin sized bed, with a mattress pad, then a hypoallergenic cover. I had read everywhere that the mattress pad is what you really want to invest in, so I got a memory foam one and I love it. My sheets, though you can't see them, are blue-ish grey, and I mostly only bought this set over an all-grey one because they seemed softer and better. Then I have two white blankets on top of those, and then my comforter, which is from Bed, Bath, & Beyond (and it's reversible!). I have a pillow in that same print and a pillow behind it (with the same color as my sheets). 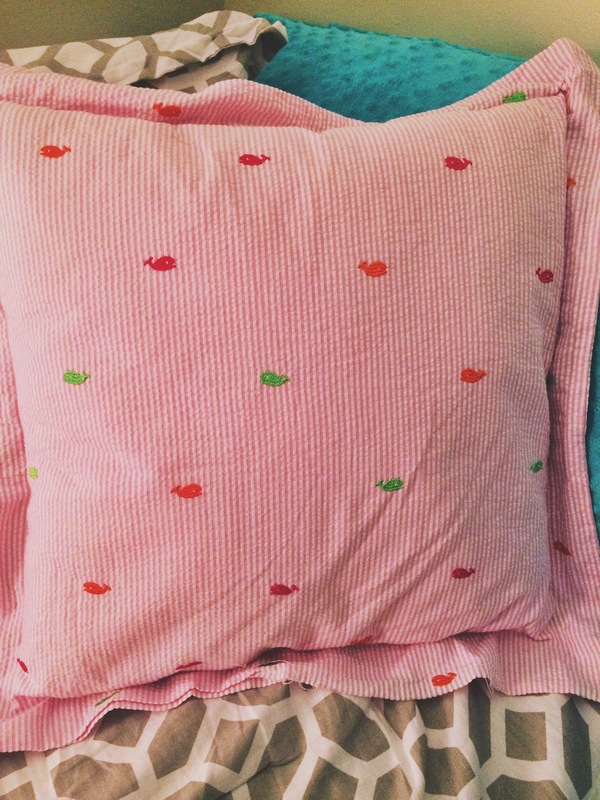 My mom and I found this adorable seersucker whale fabric and she made a pillow for me! Then I have this long turquoise body pillow from Target that I had originally just used without a cover, but my mom made me a pillow case and brought it over family weekend! I also have a pink throw from Target (but from the kid's section) that makes me happy because it has these little pom poms and such. Totes adorbs. My bedside table is a bunch of little stuff and doesn't look too fancy. But I have tissues, protein bars, medicine, food, coffee mugs, paper towels, clorox wipes, and plastic silverware all stored here! The lamp is from Target and makes me so happy, then the clock is from Timex and I actually really love it because it's Bluetooth-enabled and I can play music through my phone on it. 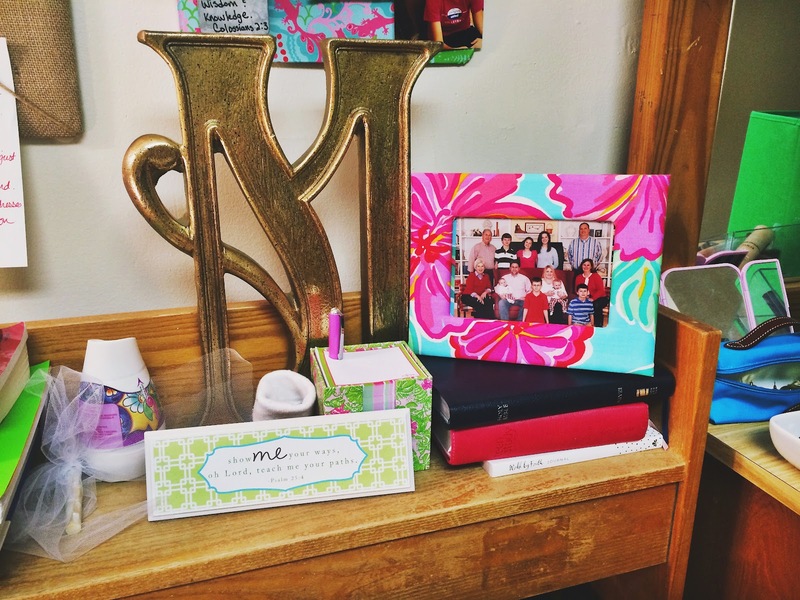 I also had to have my Lilly coasters with me here, with one right next to my bed. I know this isn't too exciting of a shot, but I had to take a minute to appreciate my bath mat next to my bed. This one and the one in front of my dresser came together from Target and it makes my room feel so much cozier and nice when I step out of bed. The big rug also makes me happy- it's from Home Goods and makes it feel less dorm-y. I'll go more into packing and storage later, but I wanted to give a quick view of my under the bed. I've rearranged it lots and will probably do a lor more rearranging if I get another box, but this is it for now. I have three large storage bins with other things in front of it. Going from left to right, I have food in a bin, then a rolly cart with more accessible food in front of it. The second box is odds and ends- tanks that I didn't want to hang and dresses that I can't hang. Then my socks and underwear are in a rolly cart in front of that. In the far back, I have a carry-on suitcase that was better to be kept under my bed, then the cream colored thing is a tote that I have all of my cardigans in. It's the Ziploc storage bag tote that had all of my air-sealed sweaters, but then I moved all my sweaters out and put the cardigans in there. In that red bag, I have bras, which really isn't great for storage, but I'm 18 and lack a better way to store them. Deal with it. The last bin has all my cable knit sweaters and sweatshirts. My mom teased me so much for packing 27 total sweaters (including cardigans and sweatshirts, though), but ya know, that's what I'm going to be wearing! My closet is also a huge love of mine and definitely not organized in this photo. My shoes are a MESS (but will they ever not be). But I have my laundry basket, shower stuff, and shoes at the bottom, then all of my hanging stuff. 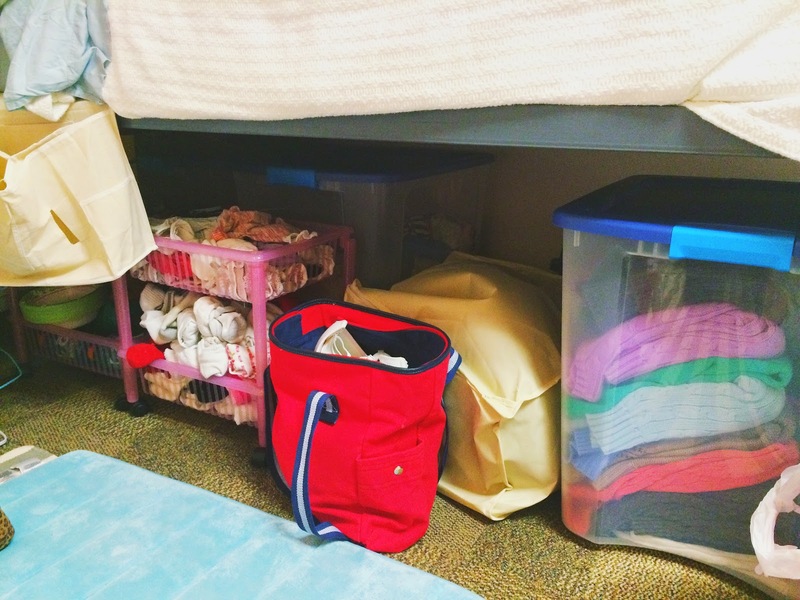 We got lucky to have such large closets in our dorms, so I have a shelf above my hanging stuff, then even more storage above that. 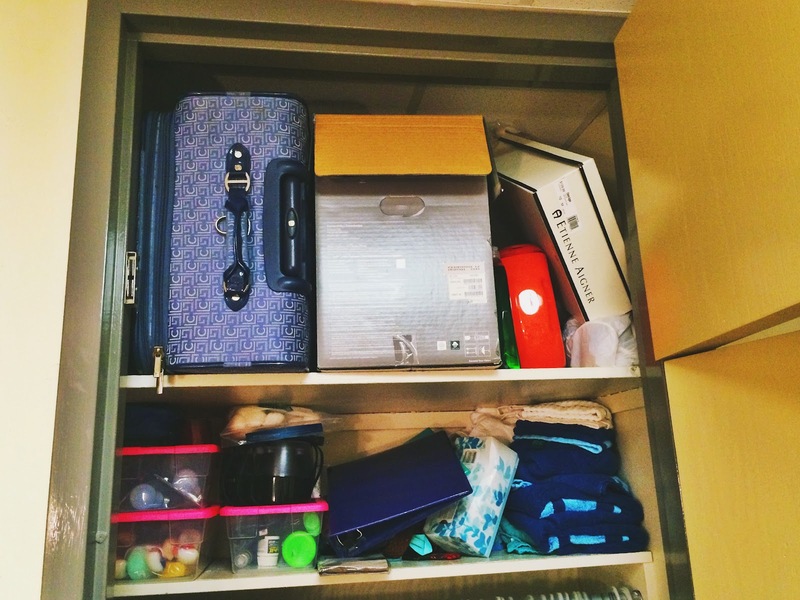 Above my hanging stuff are shoe boxes with medicines, extra cosmetics, light bulbs, things like that. Then I have extra towels and tissues and belts to the right. Again, not that organized. Up above, I have my huge suitcase (which is holding a lot, too-- mostly just feminine products), and other random things next to it. And this is our home! What do you think?! I'm excited to see how it changes this year and how I can find better ways of making it more organized! 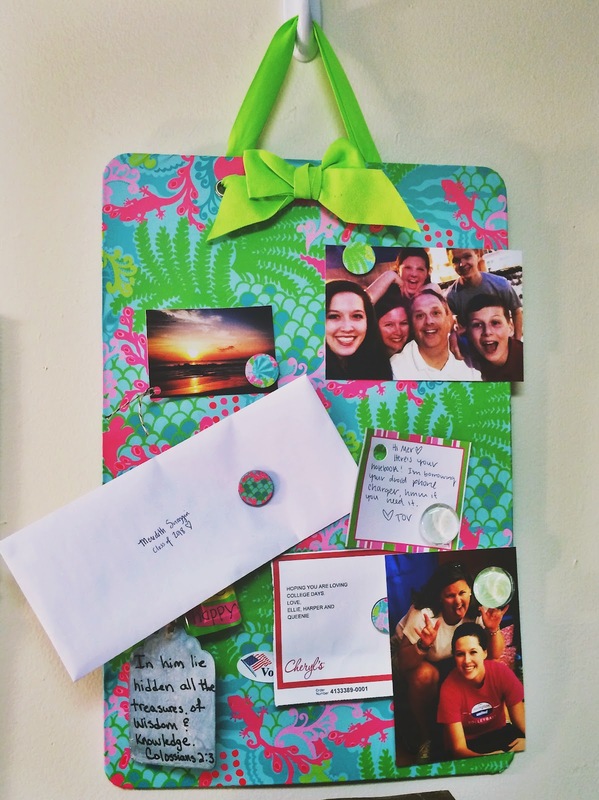 I'm in love with your memo board & your magnetic Lilly board, so cute! Also, I love your state art with all the town-names in it, so creative & cute! 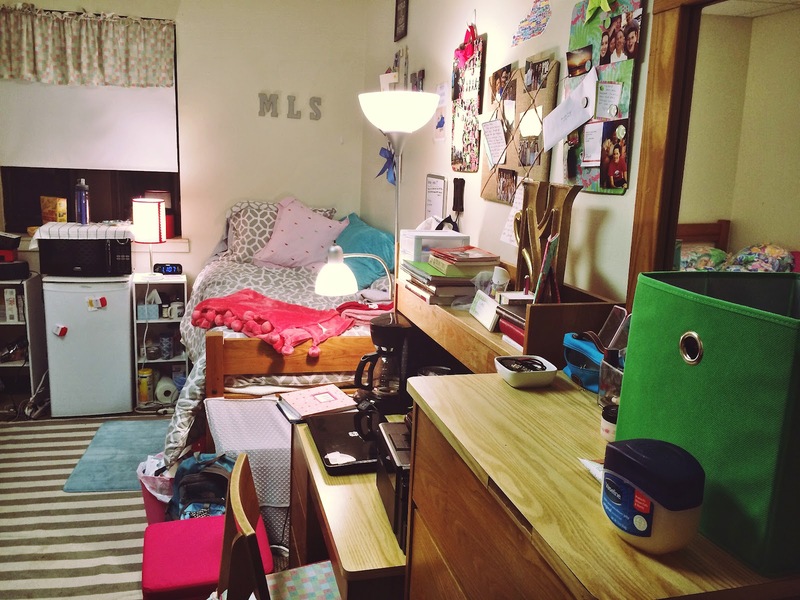 Your dorm is so cute!! 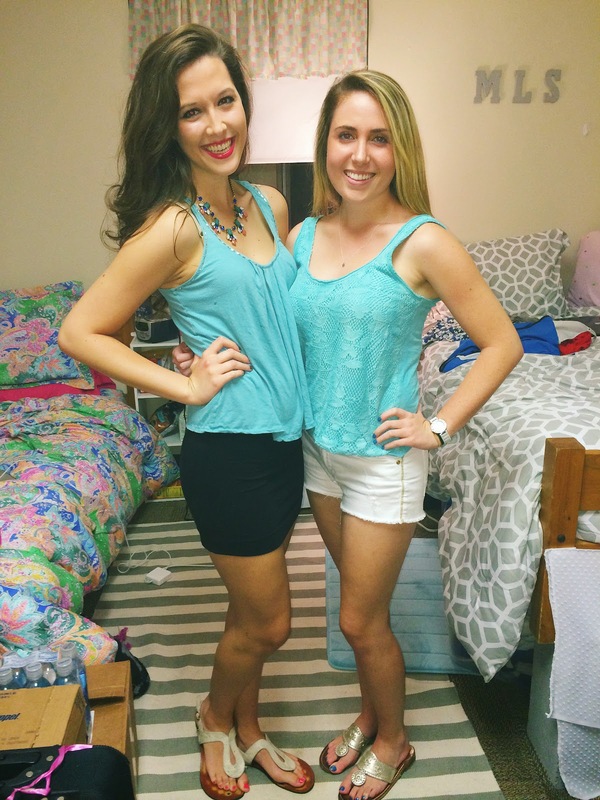 It's posts like these that make me wish I had done the dorm route instead of staying at home.